From Max Factory. 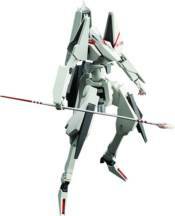 From the anime series Knights of Sidonia comes a figma of the Shiratsuki piloted by Nagate Tanikaze, Tsugumori! Using the smooth yet posable joints of figma, you can act out a variety of different scenes. An alternate 'Heigus Particle Cannon' head part is included to display the Tsugumori firing the particle cannon. The standard weapons of the Tsugumori are included - the Kabizashi spear, arm blades and a ballistic acceleration device. A pointed back booster part to pose the Tsugumori in high-speed movement poses, as well as a Gauna core that can be attached to the Kabizashi, are also included, as is an articulated figma stand.